The iFactory series focuses on prioritized markets with higher automation maturity—those with the capability to incorporate smart factory and Industry 4.0 technologies and concepts such as the automobile assembly industry, the food industry, and the home electronics industry. 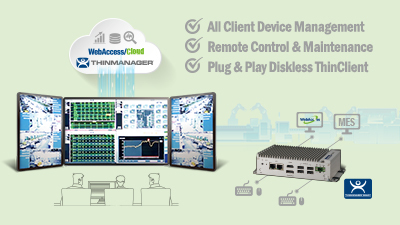 Advantech WebAccess is a 100% web-based SCADA software solution/IIoT platform with open interfaces for developing IoT applications. It also acts as a gateway for collecting data from ground equipment and transferring the data to cloud applications via MQTT publish/subscribe. WebAccess features an HTML5-based intelligent dashboard that enables cross-platform, cross-browser data analysis. WebAccess/HMI Designer is powerful yet intuitive software to create total solutions for Human Machine Interface products. WebAccess/HMI Designer is proven in many application fields and is an easy integrated development tool. An OPC sever (OLE for Process Control) provides IO and more devices to communicate with a wide range of HMI/SCADA software packages residing on a host. Advantech's OPC server for ADAM and modbus devices features OPC DA (data access) and AE(alarm and events) client for the rapid testing of data connections, supporting Advantech's modbus devices, such as MODBUS/RTU and MODBUS/TCP. Any software system with OPC client capabilities such as OPC DA and AE sever can access the Advantech OPC server drivers. CODESYS Control Solutions are complete application-ready-packages which allow users to easily achieve an open control solution, the PC-based real-time control system, enabling real-time PLC or PLC/Softmotion control with flexible Fieldbus options such as PROFINET, EtherCAT, EtherNet/IP, CANopen, Modbus TCP/RTU and providing the visualization in parallel on different HMI clients. See how this solution: - Boost Productivity with Less Downtime Save time managing computers and simplify recovery within 2 minutes. - Deliver the Right Content to the Right Person in the Right place See every client and user operating in the plant and simply set up their administration via a configuration wizard.